D: When do you think it'll leave, bro? JF: I hope soon cuz I need to pee. LOL! I didn't even SEE the cat until you pointed her out! That's a riot. Poor dogs. Priceless! I didn't see Eva til I read the caption either. P.S I love your bed! We used to! We had a cat who cured many of our foster dogs of ever looking at a cat again. Our male Greyhound lived in total fear of him! I WISH one of my cats would take on this role. The boys have no respect for our cats, because they've never lived with a mean/bossy cat. Years ago, Maggie & I lived with a little spitfire of a cat who used to chase her around. 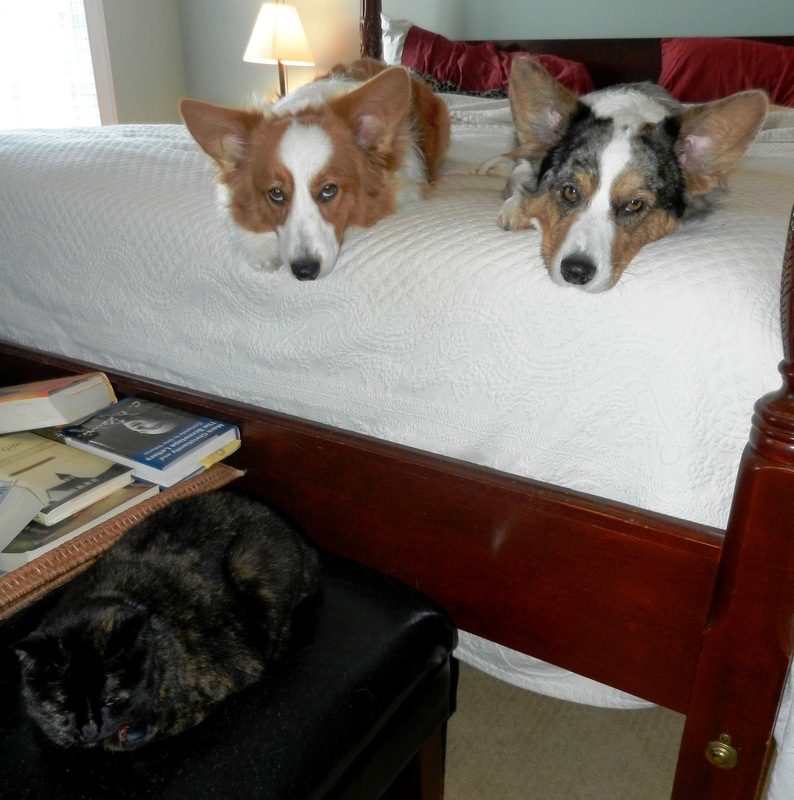 As a result, Maggie leaves our cats alone. Maybe I can borrow Eva for a while? Sam is terrified of Grace, the cat. She's never done anything mean to him but Marla had a nasty cat so Sam believes all cats are out to hurt him. I haven't had cats as a pet for a long time now. As a result, both Wilson and Jimmy have not had much exposure to them, other than a good chase if they see one outdoors. A friend of ours who dog-sits for us occasionally, used to have a cat. By the end of the week of staying there, Wilson would make peace with the cat, and things would be OK. Then we got Jimmy.....He had absolutely no intention of making nice. The second he would get in their house, he was on the hunt! He would chase the cat upstairs where she would hide under the bed. Well, that wasn't enough of a barrier to stop Jim. He's wedge himself under, barking furiously! You'd hear a loud YELP! as his face got nailed by her claws. Jimmy didn't care, he'd back out and try and get her from the other side and....YELP! Bark! Yelp! Bark! Yelp! with a few scary cat yowls thrown in....By then, I had made it upstairs and was dragging Jimmy out from under the bed by his hind legs. Well of course, cats rule the house :) We have they kick our 75 pound dog out of her bed quite often. Silly kitties! Thanks for the comments, everyone. :) These types of scenes occur all around me each day, but I rarely have the presence of mind to grab the camera. @Lani - Eva would run your cats off, too. ;) JF and Dewi disrespect my other two (especially Tigger) because they run away. Eva must have had to fight dogs for food at some point, who knows? @RDM - I can't picture Sam afraid of anything. Poor guy! I didn't know cats ruled in your family. I just thought they ruled the world.